In 1999, I joined an e-mail discussion group called Inpresence, which is made up of published authors whose works focus on the development of intuition and related topics. At one point, I sent an e-mail describing the reincarnation research that I was doing and I asked if anyone in the group knew of other cases that I could study. One person who responded was Penney Peirce, who related that she had a past-life story. Penney is a professional intuitive, counselor, perceptual skills trainer and lecturer who works throughout the United States, Europe and Japan. She is the author of Frequency, The Intuitive Way: A Guide to Living from Inner Wisdom, The Present Moment: A Daybook of Clarity and Intuition and Dreams for Dummies. I met with Penney in her Novato, California home, north of San Francisco, to learn more about her case. Let me share her story with you. Penney moved all over the country growing up, with much time spent in the Midwest and some on the East Coast. She moved from New York City to California in the early 1970s. She worked as a corporate art director and graphic designer, but pursued meditation and clairvoyance development in her spare time, in California’s then-burgeoning self-help movement. During that period in the 1970’s, a medium, who I will call Bobby Jo, regularly visited the San Francisco Bay area. In her work as a medium, Bobby Jo let non-physical spiritual beings speak through her to provide clients with information about past lives. Bobby Jo, who remained in a meditative state during this process, would have no memory of the information conveyed. This type of channeling of spirit beings is typical of how a trance medium works. I myself have worked with a trance medium, Kevin Ryerson, since 2001. Kevin channels a spirit being named Ahtun Re, who has demonstrated the ability to make past life matches with a high degree of accuracy. Past-life information is reportedly accessed from the Akashic Records, a set of memory banks or a library of the planet’s history, found in the spirit realm. Peirce describes Bobby Jo as a dramatic character, with a jovial nature and a naïve faith. Bobby Jo knew nothing about Penney when they met, nor did Penney reveal information about herself at the time of their private session. Given this background, Penney was shocked when in her reading, Bobby Jo started to rattle off facts regarding a past lifetime as if she were reading out of an encyclopedia. Bobby Jo related that in a past era, Penney’s name was Charles H. Parkhurst, that he had been born on April 17, 1842, in Framingham, Massachusetts, had lived on a farm and then become a prominent minister. Parkhurst enjoyed mountain climbing and used the pulpit to fight crime. Bobby Jo then reported that Parkhurst had written many books, among them: The Sunny Side of Christianity; A Little Lower than the Angels; Analysis of the Latin Verb Illustrated by the Sanskrit; What Would the World Be Without Religion? ; The Blind Man’s Creed and Other Sermons; The Pattern in the Mount; The Pulpit and the Pew; Talks to Young Men; Talks to Young Women; and My Forty Years in New York. Given this degree of specific information, Penney tried to verify the past-life detailed by Bobby Jo. In her investigation, she found that there was a record of Charles Parkhurst and that Bobby Jo’s description of him was accurate in every detail, including the long list of books Parkhurst had written. Penney realized that there were many similar personality attributes between Parkhurst and herself, and that there was even a physical resemblance. In assessing this proposed past-life match, Penney reflected that there was no way that Bobby Jo could have memorized all that data on Parkhurst. Further, in Parkhurst, Bobby Jo had identified an individual with character features that matched closely with her own. Penney reflected that this was particularly impressive, given that Bobby Jo knew next to nothing her. Further, this session with conducted in the 1970’s, long before the Internet was in place. Let us review some of these common traits. First of all, Parkhurst and Penney share the distinction of being published authors. Penney, as a writer, demonstrated talent at an early age, winning a National Scholastic Magazine award for a short story. Peirce has had three books published, as noted above, and in addition she has contributed to a number of other titles, such as The Celestine Prophecy and Tenth Insight Experiential Guides by Carol Adrienne and James Redfield; The Purpose of Your Life by Carol Adrienne; Intuiting the Future by William Kautz; and Channeling: The Intuitive Connection, also by Kautz. In addition to his scholarly works, Parkhurst also wrote for young people. Similarly, Penney has been writing children’s books since college, incorporating spiritual themes into these stories. Parkhurst and Penney have shared an interest in spirituality and providing service through the ministry. Parkhurst earned his undergraduate and graduate degrees from Amherst College, then studied theology in Halle, Leipzig, and Bonn. He returned to teach at Williston Seminary, in Massachusetts, and went on to become a Congregational Minister in Lenox, Massachusetts, where he spent six years. He then became the pastor at Madison Square Presbyterian Church in New York City and earned a Ph.D. and a doctorate in divinity (DD) from New York University and Columbia. Penney Peirce also has had a lifelong affinity for spiritual studies. Ever since she can remember, Penney says that “Why” was the word that motivated her behavior. She voraciously read books on world religions, psychic phenomena, and philosophy. Penney was in search of the core truths contained in all religions and became a licensed minister as a result of this interest. She has even served as a substitute minister at a Unity Church. Like Parkhurst, Penny has had a natural affinity for ancient languages. Parkhurst taught Greek and Latin and wrote a book called Analysis of the Latin Verb Illustrated by the Sanskrit. Peirce took advanced Latin in high school and scored highly in a state Latin competition. She has also had a fascination with Sanskrit and Egyptian hieroglyphs. Peirce relates that she once had a series of dreams that featured ancient Greek words, words that she had no knowledge of in her waking consciousness. Charles Parkhurst used his pulpit to right social and spiritual wrongs. Parkhurst lived in New York City at a time when political corruption was a major issue. Tammany Hall, the political regime that held power in the late 1800s, was in collusion with crime bosses. Tammany Hall police officials routinely took bribes, while the general populace stuck their heads in the sand and said nothing. Parkhurst, who served as President of the Society for the Prevention of Crime, preached perhaps one of the most famous sermons in American history in which he denounced the corruption. Parkhurst described New York City as “hell with the lid off” and challenged the public to do something about it. A roving reporter happened to be in the audience and the story made the news, arousing much public excitement and a vehement backlash from officials. Parkhurst was attacked and challenged to prove his accusations. He launched his own investigation and soon appeared before a grand jury with facts in hand. As a result, there ensued the Lexow Investigation and the election of a reform government, the Strong Administration. The appointment of Teddy Roosevelt as the new Police Commissioner followed. Like Parkhurst, Peirce also has the inclination to act as a whistle-blower and reformer. In her college newspaper, Penney published articles protesting departmental and curriculum changes that she thought were to the detriment of students. When she worked for a large corporation, she launched a letter-writing campaign to warn of unethical practices she observed taking place in her department. Penney began keeping a journal at age seven and much of her inspiration stemmed from nature and the farm. Further, the National Scholastic Magazine award she won was for a short story about the wheat fields of Kansas. Penney has also loved “working the soil” and has planted a vegetable garden every year since she was twenty. Parkhurst and Peirce also have shared a love of climbing. Parkhurst was an avid mountaineer, who vacationed annually in the Alps, climbing the Matterhorn, Weisshorn, and other great peaks. Peirce demonstrated an early affinity for climbing also. At the age of three, she climbed a cedar tree adjacent to her home and peered into the family’s second story bathroom, where her mother was applying makeup. When Penney’s mother looked outside and witnessed her three-year old daughter waving to her from a tree, she almost had a stroke! In a tragic incident, Parkhurst’s demise was associated with his love of heights. At the age of 91, Parkhurst had an episode of sleepwalking during which he strode off the roof of his porch, falling to his death. In what appears to be a residual effect of this traumatic event. Penney Peirce relates that for years she experienced recurring nightmares of driving off cliffs, falling in elevators, and falling out of trees. At the end of every dream, when she realized that she would die, Peirce would wake up in an agitated condition. When Penney had her session with Bobby Jo and learned that Parkhurst had died by falling off a roof, her nightmares abated. She had one last dream in which she fell out of a tree in “super slow motion,” consciously reviewing the stages one goes through in dying by falling. After that dream, the nightmares stopped entirely. Penney believes she had these nocturnal images of falling because Parkhurst was asleep and confused when he died, and that the experience had never been processed in a conscious manner. Peirce also feels that Parkhurst’s death by sleepwalking out a window and off a roof might be related to her own subliminal desire to leap off high places and fly like a bird. Perhaps Parkhurst had the same urge and found a way to let himself fly that fateful night. Paradoxically, Penney notes that to this day she still has an attraction, rather than an aversion, to elevated locations, to heights. Fortunately, in this lifetime Peirce lives in a one-story, ranch-style house. In her session with the Bobby Jo, Penney was also told about an even earlier incarnation. Bobby Jo conveyed that Penney’s name in that lifetime was Alice Cary, that she was born on a farm near Cincinnati, Ohio on April 26, 1820 and that she died on February 12, 1871. As in the Parkhurst case, Bobby Jo rattled off a series of books that Alice Cary had written, which included the following titles: Poems of Alice and Phoebe Cary; Clovernook: Recollections of Our Neighborhood in the West; Hagar: A Story for Today; Lyra and Other Poems; Clovernook Children; Married, Not Mated; Adopted Daughter and Other Tales; The Josephine Gallery; Pictures of Country Life; Ballads, Lyrics and Hymns; The Bishop’s Son, A Lover’s Diary; The Born Thrall; Snow-Berries: A Book for Young Folks; and Ballads for Little Folks. Once again, Bobby Jo appeared to have access to an incredible amount of detailed information on spontaneous basis. Bobby Jo also told Penney that Alice Cary had been inseparable from her younger sister, Phoebe, in that lifetime. Bobby Jo related that Phoebe reincarnated as Penney’s younger sister, Paula. Like with the Parkhurst case, it seemed impossible for Bobby Jo to have memorized all this information about the relatively obscure Cary, especially when validation of the information revealed consistent facial features, personality traits and consistent published works. As with the Charles Parkhurst past lifetime, even though Penney had never heard of Alice Cary before her session with Bobby Jo, she was able to find Alice Cary in historical records. Once again, as in the past life match regarding Parkhurst, all the detailed information that the spirit guide had conveyed to Penney regarding Cary was correct, including the specific titles of books that Cary had written, the date of birth and the date of death. In addition, the facial features of Cary and Penney are consistent. The case of Alice Cary | Penney Peirce features a karmic relationship that seems to have persisted from one lifetime to another. Recall that Bobby Jo told Penney that Alice Cary had a sister named Phoebe and that in this lifetime, Phoebe is Paula, Penny’s contemporary sister. It appears that Bobby Jo’s statement is valid. Penney learned that Alice Cary did indeed have a sister named Phoebe. 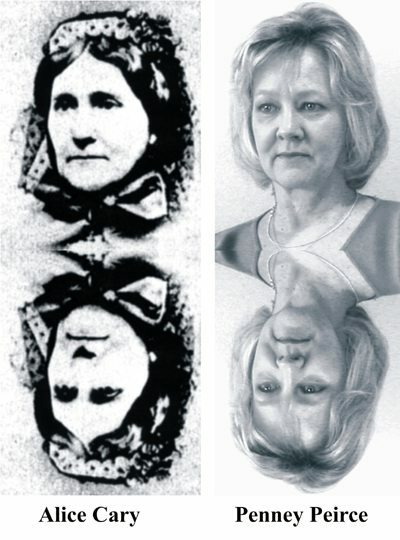 Further, Penney was able to locate images of Phoebe, whose facial features are consistent with those of Penney’s sister, Paula. Phoebe was considered to be one of the wittiest women in America, known for her ability to see the ludicrous in the glamorous, and for her great ability for parody. Penney has observed that these personality traits are consistent with Paula, who is also described as witty, like Phoebe. Penney once wrote that Paula is characterized by a “dry wit and cheerful, diplomatic disposition.” Paula is also very intelligent, like Phoebe, as demonstrated by her having earned a PhD. In a more mundane similarity, Phoebe was known to have an aversion to housework. In this lifetime, Paula has the same aversion. Paula sets money aside so that she can utilize a maid service, rather than do housework herself. Another significant parallel is observed in the relationships between the sisters, Alice and Phoebe and Penney and Paula. Both sets of sisters are approximately the same number of years apart in age, and both have had incredibly close relationships with each other. In addition to her literary pursuits, Alice Cary was a social activist, like Parkhurst and Penney. Alice was a firm believer in the abolition of slavery and a proponent of women’s rights. She became the first president of first women’s club in America, the Sorority of Sisters (Sorosis), and was friends with Jane Croly, Elizabeth Cady Stanton, and Susan B. Anthony. In a similar way, Penney became involved with the feminist movement in New York and California. She also became the art director for a feminist magazine. Alice Cary hated human repression or coercion in any form. Penney Peirce started a nonprofit organization in college to study the harmful brainwashing effects of the mass media and advertising on the general public. 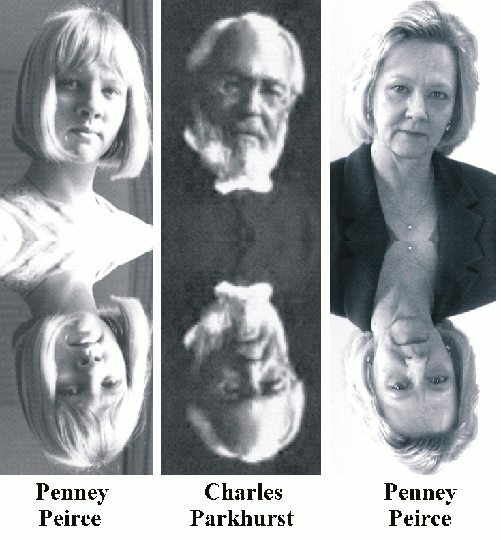 Similarly, Penney pursued parapsychology and clairvoyance development very early in her career. She has made her living as a professional intuitive. Also, Penney has served as a substitute minister for the Unity Church, which has a very similar theology to the Universalist Church. Alice Cary had an early quest for knowledge, even reading at night by the light of burning lard when candles were not available to her. Cary loved nature and wrote prolifically about scenes from rural life. Penney also has a love for nature, as did Parkhurst, and she lives in a setting of rolling farmland. Penney began keeping a journal at age seven and much of her inspiration stemmed from nature, animals, and the farm. Like Alice Cary, Penney published articles and poems in her teens. The National Scholastic Magazine award she won, we recall, was for a short story about Kansas wheat fields. Another parallel Penney has noticed between her own writings and those of Alice Cary and Charles Parkhurst is that all three focused on the need to demonstrate spiritual values in everyday life, in intention and through small actions, and that the practice, the process, and the experience itself is more important than just talking about lofty goals. Peirce has selected the following quotes from their books to illustrate this point. Please note that Penney’s quote was written before she learn of her proposed past lives as Cary and Parkhurst. Please note that in the Anne Frank | Barbro Karlen reincarnation case, a similarity in content in published writings across lifetimes was also observed. Penney notes that she seems to be an interesting link between the masculine, more intellectual, minister, Charles Parkhurst, and the emotional, feminine poet, Alice Cary. In her writings, Penney combines elements of both. It is interesting to observe that in Penney’s reincarnation cases, though the styles of rhetoric may vary with changes in gender and era, core ideas stay the same. As an example, Penney went to college at the University of Cincinnati, in Ohio, only a few miles from where Alice was born. Here, like Cary, Penney began writing poetry in earnest. Also in college, Penney had a boyfriend who wrote poems to and drew portraits of a fictitious woman. Her boyfriend referred to this woman as his muse and he called her “Alice,” as if he were intuiting Penney’s past life as Cary. Interestingly, Alice Cary had been jilted by a boyfriend when living in Ohio, which prompted her to suddenly move to New York City. Penney wonders whether her college boyfriend might have been the same man who jilted Cary. After Alice Cary moved to New York, her sister Phoebe soon followed. The women had moved to the city with the intention of making their living from literature—a very adventurous thing to do. 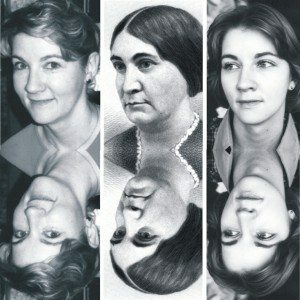 Together, they wrote and published many books of poetry and fiction. In New York, Alice and Phoebe Cary were fondly known as “The Sisters of the West,” as Ohio was still considered the western edge of adolescent America at that time. The Cary sisters became beloved by the intelligentsia and other types as they hosted a popular literary salon in their home for over fifteen years. Attendees included thinkers, philosophers, early feminists, writers and prominent personalities of the time, such as Horace Greeley, Edgar Allan Poe, John Greenleaf Whittier, and PT Barnum. In what appears to be a parallel path, Penney also left Ohio abruptly, before graduating from college, and moved to New York City. In New York, Penney, like Alice Cary, soon became involved with a group of feminist writers and other authors. In another geographic correspondence, Penney’s job was situated near Gramercy Park, only blocks from where Alice and Phoebe Cary had lived. In New York, the life of Charles Parkhurst also becomes intertwined with theirs. Penny’s apartment on West 80th Street was only blocks from where Charles Parkhurst resided on West 74th. She attended night school at New York University and Columbia, which Parkhurst also attended. In time, Penney moved to Park Slope, Brooklyn, close to where Alice and Phoebe are buried in Greenwood Cemetery. In another odd parallel, Parkhurst, late in life, traveled from New York to Los Angeles to marry a second time. Similarly, Penney left New York City for Los Angeles to complete her degree in design at the California Institute of the Arts. She also notes that in the year after her session with Bobby Jo, her parents moved near Framingham, Massachusetts, the birthplace and childhood home of Charles Parkhurst. In visiting her parents, Penney has been able to revisit Parkhurst’s old stomping grounds. 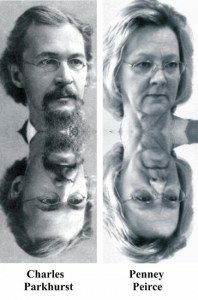 The compelling reincarnation cases of Charles Parkhurst | Penney Peirce and Alice Cary | Penny Peirce demonstrate a very interesting and important phenomenon, that a soul can animate two different bodies at the same time. I have termed this split incarnation, as it appears that the soul can split itself, or project itself, into different physical bodies at the same time, This phenomenon has also been called parallel lives. Alice Cary, the earliest incarnation in this series of lives, was born in 1820 and died in 1871. Charles Parkhurst was born in 1842, at a time when Alice Cary was 22 years old. Alice Cary died in 1871 at the age of 51, at time when Parkhurst was 29 years old. As such, the lifetimes of Cary and Parkhurst overlapped by 29 years. Parkhurst died 52 years after the death of Alice Cary, in 1933. Penney Peirce was born in 1949, 16 years after Parkhurst’s death, 50 miles from the location where Parkhurst died. Did Cary and Parkhurst Ever Meet? It is of interest to wonder if Alice Cary and Charles Parkhurst ever crossed paths. Though there is no evidence to support that Cary and Parkhurst ever met, it appears that they did come in close proximity to each other. In 1850, Alice, at 30 years of age, journeyed from Ohio to visit John Greenleaf Whittier at his Massachusetts home, not far from where Parkhurst was living on his family’s farm in Framingham. Parkhurst was as an 8-year-old boy at the time. The two people had another episode of geographic proximity 20 years later, in the summer of 1870 when Alice Cary made her last foray out of New York City to visit friends in Northampton, Massachusetts. Cary was 50 years old at the time. Parkhurst, who was now 28 years of age, was living nearby in Massachusetts and was married in Northhampton 8 months later. Parkhurst moved to New York in 1880, nine years after Cary died. Though it appears that the two never met, it is likely that Parkhurst knew of Cary. When Parkhurst was a young man, Cary was in her prime as an author, contributing to many popular magazines of the time. It is possible that Parkhurst read articles written by his split, Alice Cary. Physical Resemblance: The facial features of Alice Cary, Charles Parkhurst and Penney /principles-of-reincarnationPeirce are consistent. Past Life Talent: Alice Cary, Charles Parkhurst and Penney Peirce have all been published authors, whose focus has been on spirituality. 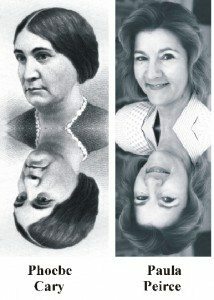 Relationships Renewed through Reincarnation: Alice Cary was very close to her sister Phoebe, who appears to have reincarnated as Penney’s sister Paula. Reincarnation and Gender Change: In these series of cases, Penney had a past lifetime as a male, Charles Parkhurst, and a past lifetime as a female, Alice Cary. Split Incarnation or Parallel Lives: The lives of Alice Cary and Charles Parkhurst overlapped by 29 years. 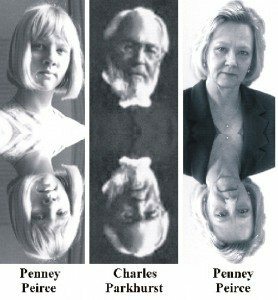 Spirit Being or Spirit Guide Involvement: Penny Peirce’s past life identities were revealed by a spirit guide channeled through a medium. 1. Charles H. Parkhurst, My Forty Years in New York, MacMillian, New York, NY, 1923, p. 20. 2. Charles H. Parkhurst, My Forty Years in New York, MacMillian, New York, NY, 1923, p. 20. 3. National Cyclopedia of American Biography, Vol 1, White and Co., p. 535. 4. Mary Clemmer Ames: Alice and Phoebe Cary, Hurd and Houghton, New York, NY, 1873, p. 93. 5. Quote provided by Penney Peirce from an Alice Cary website, source not identified. 6. Quote provided by Penney Peirce from a Charles Parkhurst website, source not identified. 7. Penney Peirce:The Intuitive Way, Beyond Words Publishing, Hillsboro, OR, 1997, p. 10. 8. Charles H. Parkhurst: My Forty Years in New York, p. 230. 9. Penney Peirce, from personal unpublished journal. 10. The Ladies’ Repository, Sept. 1855, “Literary Women of America; Number VI, Some Notice of the Writing Genius of Alice Cary,” editor, Rev. D. W. Clark. 11. Charles H. Parkhurst, A Thanksgiving Message from Dr. Parkhurst, the Foremost Patriotic Preacher in America,” Amherst Library. 12. Penney Peirce: The Intuitive Way, Beyond Words Publishing, Hillsboro, OR, 1997, p. 82. 13 .From “God is Love, “ by Alice Cary, reprinted in: Mary Clemmer Ames, Alice and Phoebe Cary, p. 263.